I had so much fun teaching this class (and who knew I could talk so long about fabric?). 10 lovely ladies joined me for the afternoon and they each created their own unique doll – some with button joints, some out of linen, and some with ears in places that the makers weren’t expecting, but that were a delightful surprise anyway. A room full of whirring sewing machines, and creatives who are so encouraging to each other, well, doesn’t get much better! To reserve a spot in the class, you can purchase a Sew With Me listing in my Etsy shop. 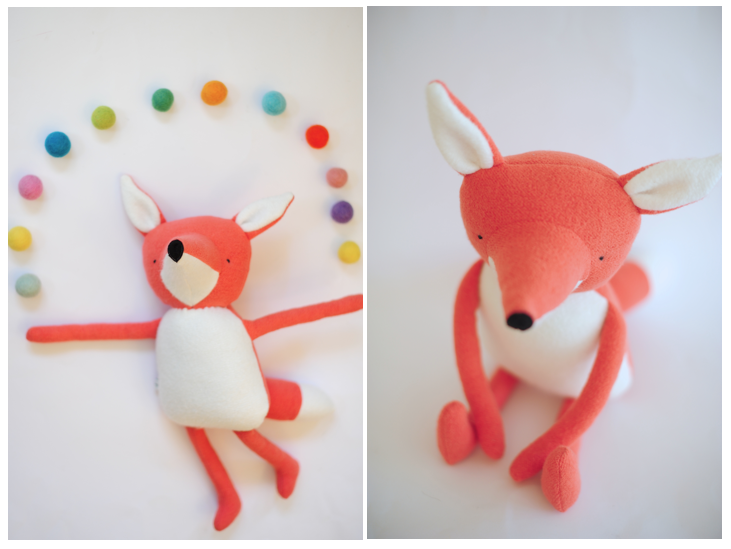 We will be creating this sweet little fox shown here! The natural materials for this project include Organic cotton fleece and wool stuffing (regular polyester stuffing will be available too if you prefer). These are beautiful materials that are not available locally, so this is a great chance to discover how to with them while we learn the basics of making a soft toy. The final product is baby-friendly (no small parts). I will refund your spot up to 2 weeks before the class. No refunds will be given after that – please check the date and time and make sure it works for you! Looking forward to sewing with you! 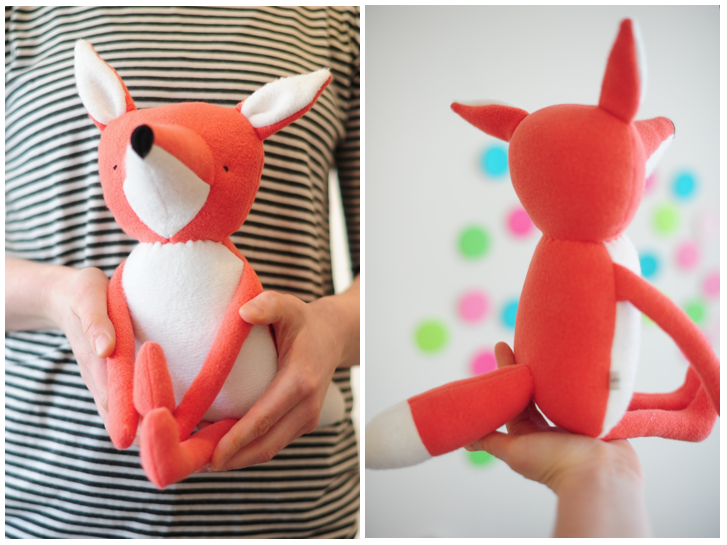 This class is a great way to learn about soft toy making. 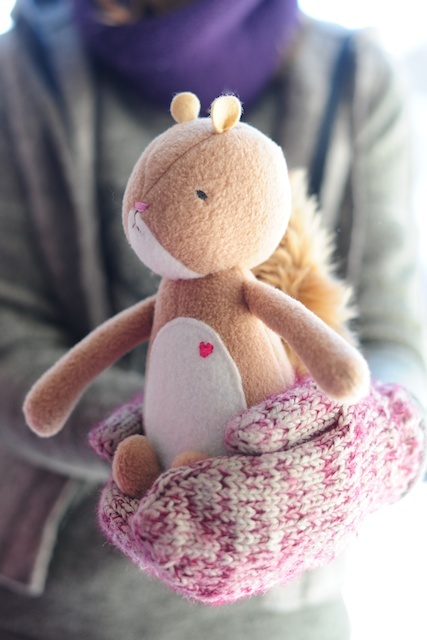 We will all work our way through sewing one of these charming squirrels, covering basic skills for sewing plush creatures and getting comfortable using fleece, faux fur, and simple embroidery. This pattern is a boolah baguette original, and of course there is always room to add your own one of a kind touches to your handmade critter. 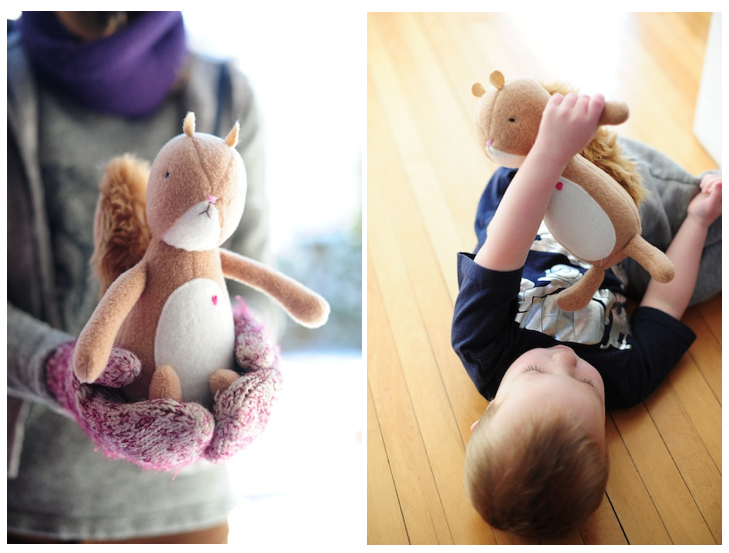 This class includes all of the materials needed to make a squirrel as shown here. I will provide a pattern and assistance throughout the class. *Is this class for me? You will need to bring your own sewing machine (or borrow one, just make sure you know how to thread it, wind the bobbin, etc. ), and a few extras such as scissors and thread. A full list of what to bring and any further information will be emailed to you once you have registered in the class. If you would like to register for this class, please send an email to boolahb@gmail.com. Include your name, phone number, and preferred method of payment. Payment can be made online through paypal or etransfer, or by cash or cheque in person. Payment must be received by February 23.